The Max M. Fisher Online Archives provide a glimpse into Max Fisher’s amazing life. His impact on the city of Detroit, US / Israeli relations, fund raising for Jewish causes and many other activities is beyond measure. This website offers the details you need to uncover the stories that most interest you. The Narrative section features four original videos that focus on the character traits Max was known for throughout his life: Wisdom, Generosity, Service and Leadership. The Timeline highlights over 150 important events at several different phases of his long and productive life. The Resource Center includes source documents from his personal archives as well as hundreds of photographs, video clips and articles. The Voices section highlights a sampling of the best videos included on the website. Below are some ideas that you might use to dig into the content found in this website. There are many paths to understanding Max Fisher's accomplishments. This website is designed to give you the tools to search for specific content or browse through the items that interest you most. This website offers four original videos in the Narrative section. They are a good start place because they touch on many different aspects of Max Fisher's life — from business success to his close relationships with many US Presidents — from his plans to improve Detroit to his enduring generosity toward Jewish causes that spanned six decades. Each of these videos feature photos, documents and video clips that are available for closer inspection in the Resource Center. You can browse these items and begin to uncover more details that will lead you to the Resource Center for more information. Max Fisher was an amazing role model. He was a tireless worker and spent much of his life trying to help others. The Timeline section of this website is a great introduction to the decisions he made and the causes he championed from rebuilding Detroit to helping shape the future of Israel. The Timeline covers every year of Max's life — from 1908 to 2005. You can click on the Timeline items that include photos or video clips and see a full size image and more details. By clicking on Learn More you will be linked to the Resource Center where you can zoom into the photos to see them more clearly. 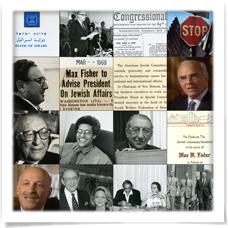 The Teaching Resources section includes lesson plans, relevant Jewish texts, a compendium of quotations cited, and a list of suggested resources for advanced research, all focused on Max Fisher's four key values: Wisdom, Generosity, Service, and Leadership. Lessons range from individual and group activities, to writing assignments, values clarification exercises, social action projects, music and film analyses, and trigger questions for further thought. This online Resource Center contains over 800 documents, photographs, articles and videos that were collected from Max Fishers archives as well as several other sources including the Presidential libraries of both Gerald Ford and Richard Nixon. These were chosen from tens of thousands of potential items in order to give a broad cross section of his work, his friendships and the incredible scope of his accomplishments. The Resource Center is a relational database with keyword search as well as advanced search capabilities. Max Fisher maintained an extensive archive of photos, documents, letters and articles. His papers were donated to the Reuther Library at Wayne State University in 2012. They are undertaking the process of archiving and maintaining the thousands of artifacts in his collection.